Hanging on the cliff-face under the renowned Blanco Renaissance Museum, Blanco Par Mandif certainly turns the heads of those passing by. With its unique location, this fine dining restaurant serving gastronomy styled Indonesian food, enjoys views over Ubud’s Tjampuan Bridge, Lebah Temple and the lush valley that holds it all together. 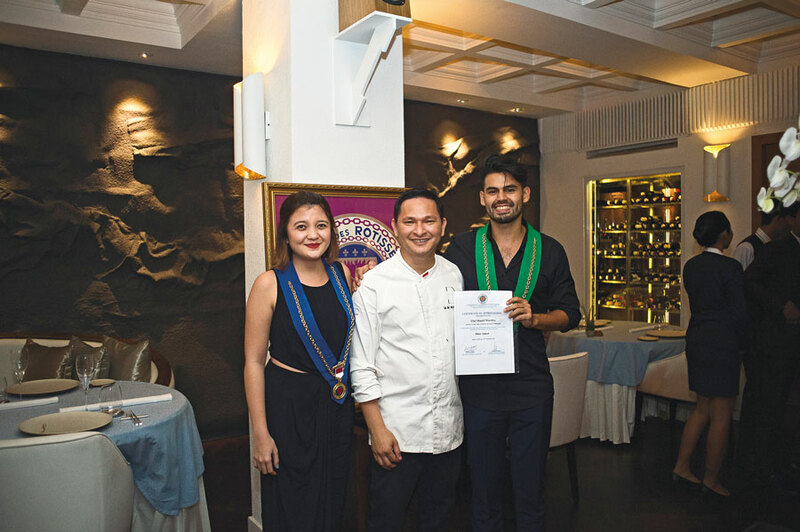 It was here that the members of the ‘Jeunesse de Legian, Chaine des Rotisseurs Bali’ dining group gathered on Saturday, 25th November, 2017 to experience the unique menu created by Chef Mandif Warokka. 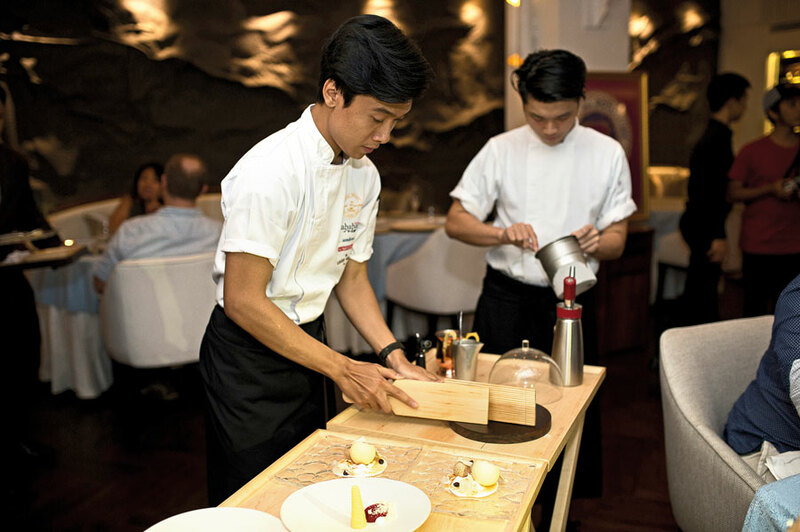 The restaurant is Chef Mandif’s passionate creation, a place where his experience in the fine dining world collides with his love for Indonesian cuisine. Since 2015, Blanco par Mandif has been (pleasantly) surprising its diners, but now with a new dining area and refreshed menu the Chaine patrons were ready to give the restaurant another test. 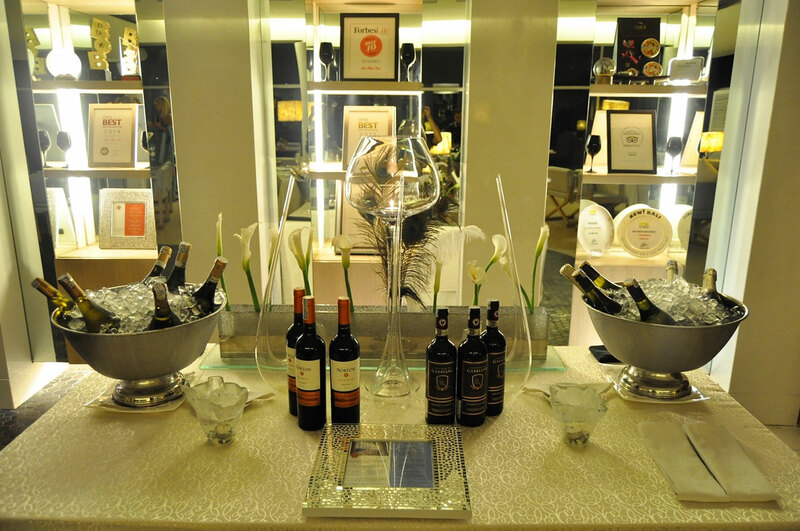 Dressed in black, 15 members and guests mingled in Blanco’s welcoming foyer enjoying drinks and canapés. Even here the diners knew they were in for something special, as reimagined Indonesian bites circulated: Tuna ‘Dendeng’ (originally a sweet beef jerky), Fried Tofu Balls with Aioli sauce and mini tacos filled Indonesian beef tongue. 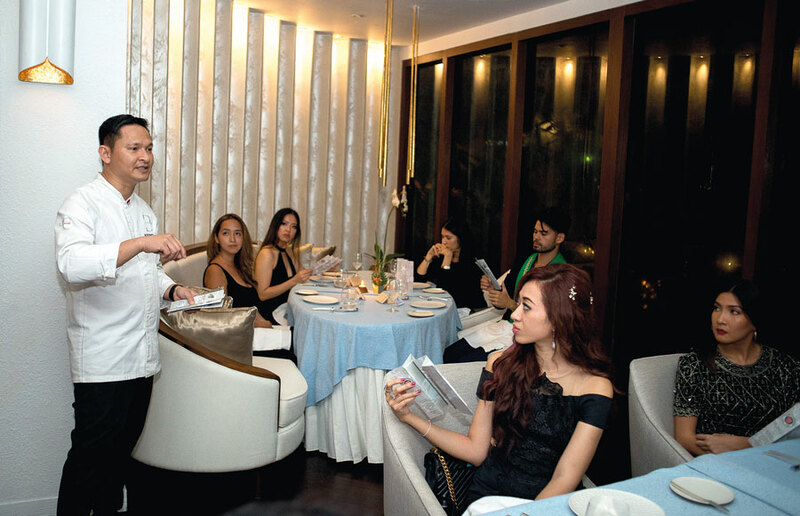 Seated in the new dining area, Chef Mandif himself gave a warm welcome to his guests. Whilst his introduction may have helped to explain the concept of the menu, none of the diners could have expected the experience that followed. The dinner began with an array of aperitifs spread out over the table. Like the canapés, these were creative adaptations of Indonesian dishes. These included fermented long beans in a ballyhoo chilli relish (sambal), pickled jicama with star anise and Singaraja vinegar, tuna toro tartar with tomato and chilli relish and a special siomay crab cake. While these were only small bites, each were unique and tasty. Following this was an introductory bread course. The dark sourdough bread was made in-house out of fermented dough and was served with 2 special dips, a coconut crème fraîche dip and a vinegar from Singaraja, North Bali. Finally, after a series of enjoyable teasers, the ‘real’ dinner began. 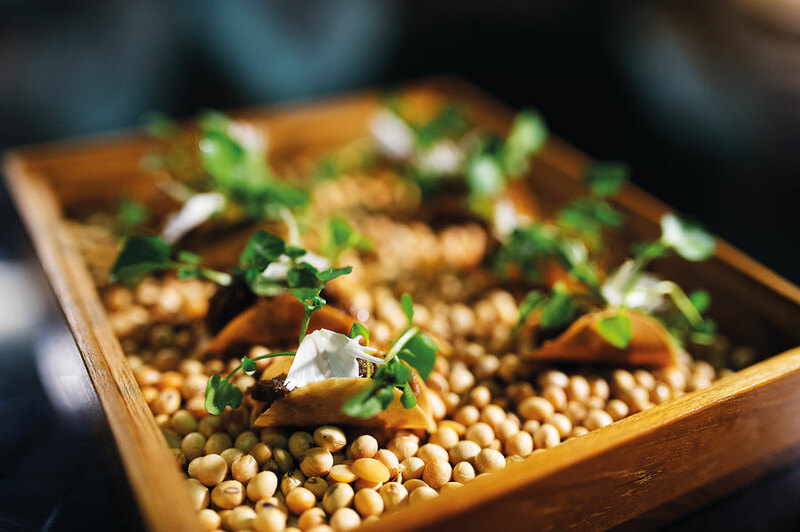 The amuse bouche was a Blanco signature take on ‘asinan’, a Jakartan street-dish comprised of pickled fruits and vegetables served with a spicy peanut sauce and a deep fried cracker. 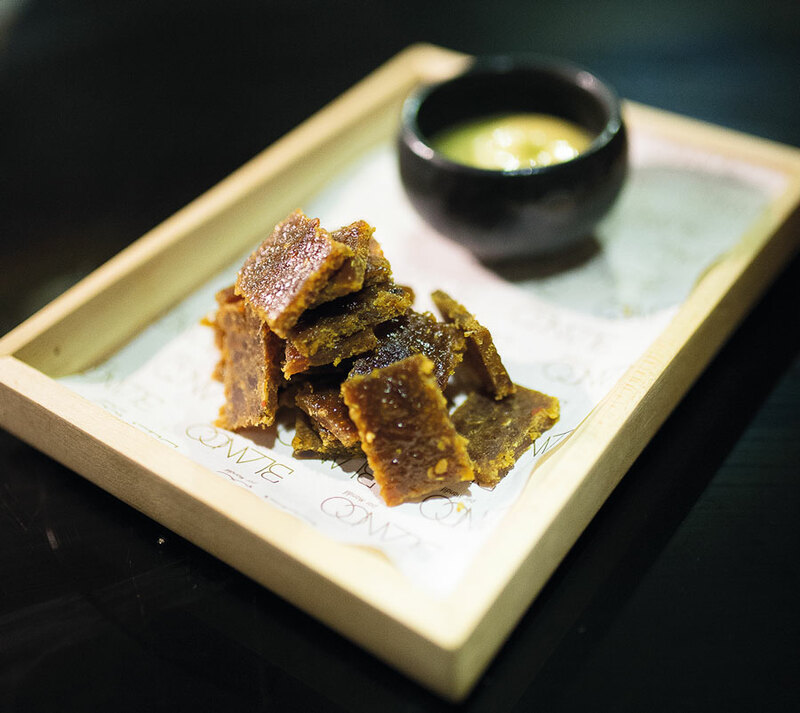 In Blanco, the sauce was made by blending the creamier cashew nuts with vinegar for a smoother, fuller texture. This entrée was well-received by the diners, clearly already impressed from the start. The first course was octopus, first smoked over coconut husk for 6-hours before being lightly grilled. 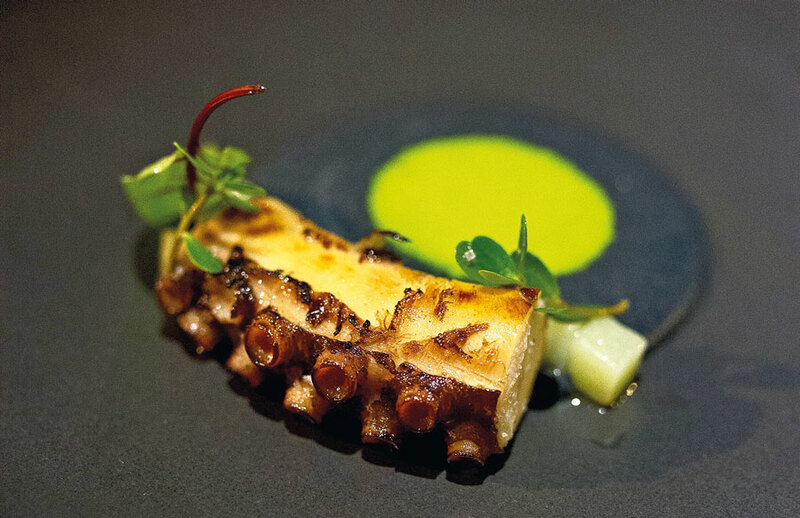 Soft to the bite, this fragrant octopus was served with an emulsion of kidney bean and black bean inspired by the brenebon soup of Sulawesi, as well as a balancing parsley aioli. This was paired with a Blanco take on an El Chapo cocktail, with fresh cucumber, cilantro and kalamansi (calamondin). Next was a rich seafood ravioli with Jimbaran prawns and clams, although, the ravioli themselves were filled with the rare ingredient of calf brain made into an Indonesia gulai (curry-like dish), all of which was showered in a light turmeric curry. 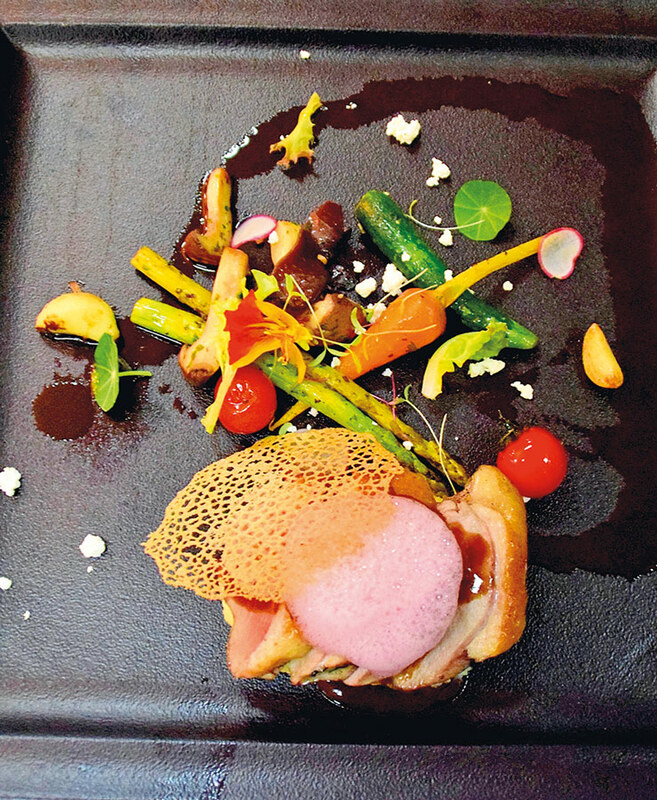 This dish was paired with a Domaine de la Negly Oppidum Chardonnay (2015). Moving onto the main dishes, next was the 20-day dry aged peking duck breast. Incredibly rich and served beside a creamy cassava purée and a tangy duck satay with traditional Balinese sambal matah, a dry relish of chilli, shallots and oil. This dish was paired with an Ellatior cocktail comprised of pineapple and torched ginger. The pièce de résistance was a 60-day dry aged Kagoshima wagyu with smoked green chilli sambal, cilembu sweet potatoes and carrots. This was paired with a Casa Marin Gran Reserva Syrah (2013). To finish, diners had a choice of the Blanco par Mandif signature Cassava Gethuk, a classic Javanese dessert theatrically fashioned into a cone, served with a side of chewy lemon sorbet (kalimansi) and red bean espuma (foam). Others chose the Kelapa (or coconut) Tart, with cinnamon custard, raisin and rum. These were paired with a Bell’Agio Rosso. However, in true Blanco fashion the meal continued with mignardises. Inspired by traditional Indonesian ‘jajanan pasar’ or market snacks. These include kue ku, kue cucur, kue kenari, kue lekker pancakes and chocolate pralines. Needless to say, each dish served that evening was an incredibly unique take on Indonesian food and flavours. Chef Mandif has found a balance in honouring traditional dishes whilst simultaneously succeeding to serve a menu of modern gastronomy. 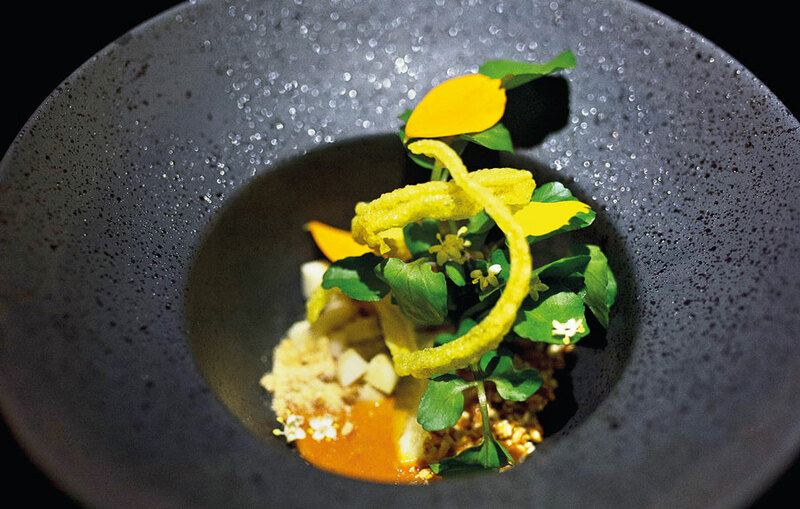 His menu proves that Indonesian cuisine certainly has a place in the fine dining world. Whilst yes, the dinner does take an extended time to go through, dining here should be seen as an experience, a journey through Indonesian flavours and culinary creativity. Each dish is immaculately plated, presented and explained, with the young chefs of the kitchen responsible for describing the food they have prepared to each table. 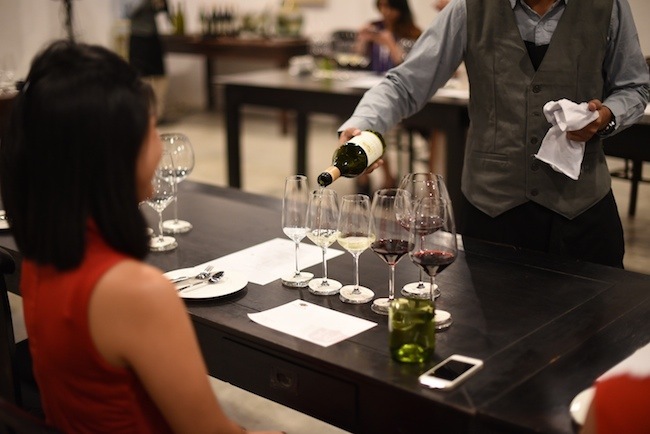 The drinks too are explained in detail, as many of the concoctions follow the same Indonesian theme and in some cases take as much preparation as the dish it is paired with. The originality of both the food and drinks at Blanco par Mandif, tied together with the attentive, professional service made for an incredibly special Chaine dinner, one which will surely have the guests and members going back for another culinary experience. 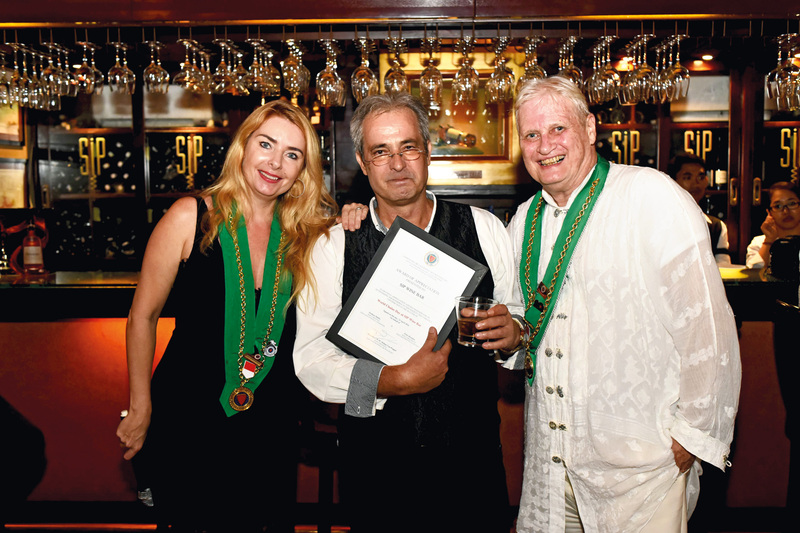 For more information about Chaine des Rotisseurs Bali, go to www.chaine-bali.org.